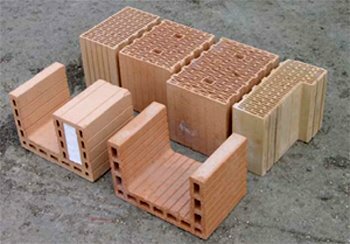 Thermoplan or Zeigel Blocks are fired clay blocks which use about 1/3 less energy to make compared to concrete blocks, and about 2/3 less CO2. They are fast, simple and ideal for a self builder to use. About 50% of German homes are made this way and the technology is spreading to other areas of Europe. Thermoplan systems use Ziegel blocks with a thin bed of mortar, to provide a breathing wall construction system. When combined with woodfibre board they can form a thermally and acoustically high performance shell. The Ziegel blocks come as part of a full load-bearing external and internal wall masonry system, and combine high thermal performance with robustness, speed of build and a breathing wall design. Because of all the trapped air and the thickness of the walls, these blocks provide reasonable insulation, while at the same time do provide some degree of interior thermal mass for maintaining constant interior temperatures. This is an unusual combination of these two factors in a single wall system. See www.burdensenvironmental.com or www.natural-building.co.uk for information for this innovative system.